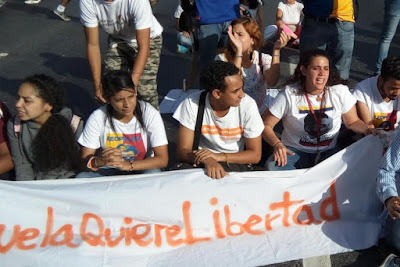 Today Ana Karina García, the Voluntad Popular's national youth leader called for Venezuelans to assemble on February 18th and shout with one voice: "No more Dictatorship" and that young Venezuelans on Youth day remained on the street to remember the struggle initiated three years ago. For a times these youth closed down a highway to commemorate the 203rd anniversary of the Battle of the victory and to remember those fallen on February 12, 2014. 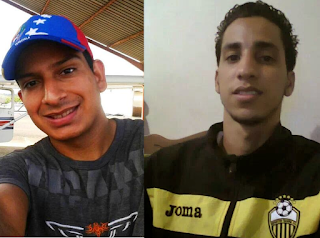 Three years ago today nonviolent student protesters Bassil Da Costa and Robert Redman were gunned down on February 12, 2014, the Youth Day in Venezuela, while engaged in nonviolent street protests against the government of Nicolas Maduro. Robert Redman was shot and killed hours after he had carried Bassil who had also been shot and killed earlier that same day and tweeted about it. "Gentlemen, he who is here will go out tomorrow to find a better future." - Bassil Alejandro Dacosta, age 24 , over Facebook on February 11, 2014. 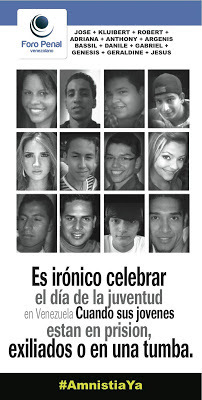 Last year the Venezuelan human rights organization Foro Penal published and distributed the above image with the names and images of young Venezuelans murdered during the 2014 anti-government protests along with their first names which states: "It is ironic to celebrate the Day of the Youth in Venezuela when her youth are in prison, exiled or in a tomb." "Three years ago, faced with the infamous capture order against my person, I decided to stay and face this dictatorship. I would do it a thousand times over!" A big hug to Bassil's mother, Robert's father and Juancho's family. All victims of the violence of this dictatorship. Public pressure and international scrutiny led to the killer of Bassil Da Costa being brought to justice his name is José Ramón Perdomo Camacho, a state security agent of the Maduro regime, who was sentenced to 29 years in prison on December 1, 2016. Venezuela is no longer a free country but there are courageous Venezuelans struggling to free their homeland.